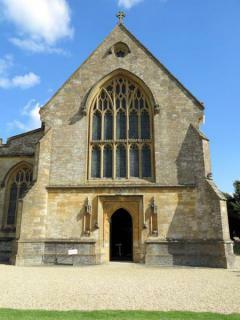 St John's church in Milborne Port originally dates from the 10th century. The present Grade 1 listed Church includes a mixture of styles from Romanesque (Norman as well as Saxon) to the 19th century. The chancel (Lady Chapel) contains some Anglo-Saxon stone-work but is mainly Norman with later changes and additions. In 1972 two sculptures (of St John and the Virgin Mary) by John Skelton were added. The 70 foot tower comprises three sections. The lowest is part of the original building; the second is Norman and the top, belfry level, was added in the 15th century. The nave was extended by 28 feet and a new, higher roof added from 1867 to 1869. The north aisle was built at this time. The south door is Norman and this section of wall was unchanged when the nave was extended. A book giving a short history of the Church is available in St John's church.